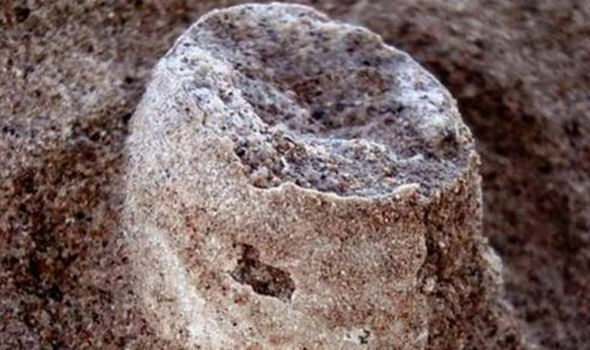 Dinosaur eggs with embryos still inside of them—dating back 70 million years—have been unearthed by scientists in Argentina. The discovery has created a buzz of excitement among worldwide archaeologists and paleontologists. The discovery was made 160 kilometers to the northwest of the city of Neuquén in Argentina. The finding, which was in fact made several years ago by a local Shepard in the area, was only recently revealed to the public during an exhibition by Neuquén provincial director of Cultural Heritage, Claudia Della Negra. Speaking about the historic find Della Negra said: “Auca Mahuevo is a site where dinosaur eggs appear in nests and around them, remains of the animals that ate the eggs. “The site was a swamp that at the time was gently covered by water and this caused sediment to cover and drown the embryos inside the eggs. The other sediment came from the Auca Mahuida volcano ten million years later. Officials from the area say that “the idea is to create a ‘Paleontological Park’ that people can visit although the priority is to preserve this site for future generations and learn more from the dinosaur eggs. The research team includes paleontologist Rodolfo Coria, who also worked on the rescue of the nesting site located in Cerro Auca Mahuida, near the town of Añelo. Della Negra excitedly said that the site Auca Mahuevo dates back 70 million years and is monitored by locals and security agents. Furthermore, the Argentinian anthropologist said that the eggs were preserved thanks to volcanic sediments that covered them. The dinosaur eggs were revealed after wind and water eroded parts of the land where they were buried. Della Negra added: “We are investigating the embryos and analyzing the embryonic skin and dentures. Della Negra warned that it is imperative that people understand the importance of the preservation of the eggs, saying that it is vital for science. The anthropologist asked people NOT to go searching for dinosaur eggs. “We always ask people, whether a worker, a ‘farmer’ or a tourist that if you find something, do not take it from the place. If you find a painting, leave it intact, do not make graffiti because any finding is important. Although the exact origin and timing of the evolution of dinosaurs is the subject of active research, the current scientific consensus places their origin between 231 and 243 million years ago. Dinosaurs became the dominant terrestrial vertebrates after the Triassic–Jurassic extinction event 201 million years ago. Their dominance continued through the Jurassic and Cretaceous periods and ended when the Cretaceous–Paleogene extinction event led to the extinction of most dinosaur groups 66 million years ago.